from Burt’s Bees. I am loving their Facial Cleansing Oil. It is 100% natural, made from a blend of Coconut and Argan oils. It dissolves dirt and makeup, leaving your skin clean and soft. This cleanser is gentle yet effective. So get clean with Burt’s and get dirty with…. yes please! In Italian lusso = luxury, Seta = silk. That is the inspiration for the name Luseta. And I am all about this brand. I have been using their Tea Tree & Argan Oil Shampoo & Conditioner. ” Tea Tree Oil is effective in thoroughly cleansing and improving the health of the scalp, removing any impurities, and acting as a natural antidandruff remedy. 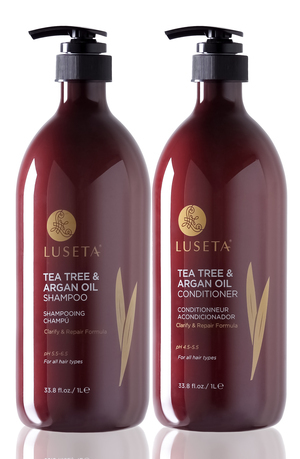 Combined with the nourishing and restorative properties of pure organic argan oil, Luseta Tea Tree & Argan Oil series works to leave the scalp feeling refreshed while locking in moisture and shine into each strand of hair.” The line is sulfate, phosphate, & paraben free. So lather up with Luseta, and get used to luxury….